The weather overnight was horrendous and it was relief to wake up this morning to see all our fence panels still intact! As I loaded my kit up, I was pleasantly surprised that it was nowhere near as windy as they’d forecast but I was well aware how quickly things can change after yesterday! I got to Bridgwater and as I pulled into the carpark, it looked like there was a good turnout judging by the number of cars. All the usual faces were there plus the Tart who was back for another go after getting battered both sides on Sellicks yesterday! 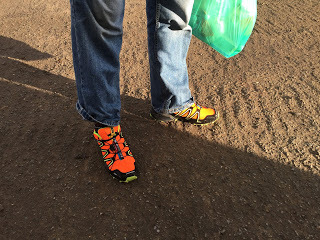 He also turned up wearing the most disgusting trainers ever! The draw was announced and I quite fancied a peg in the early thirties as they’ve been really consistent for silvers or even 18 or 19 down the end where I was on Wednesday but I pulled out peg 26 on the track side which I thought might be too far down. Martin Addicott gave me some hope when he said him and his boy had some nice skimmers and tench from peg 28 during a pleasure session in the week. Pete had put every other peg in to give us some space and my nearest neighbours were Jess Jordan on peg 24 and Rob Birch on 28. The wind was quite blustery and just enough to be a right pain so that every time it gusted you were looking around to make sure everything was where it should be! I set up a 10 x 11 MW F1 Slim to fish at ten metres and a little 0.3 gram NG XT Mini Gimp for the five metre line where it was a little deeper. This rig would also come into play on the longer line if the tow was bad as a few inches of line on the bottom would hopefully help with presentation. I was using Sticky Method Pellets again and for the hook I had the usual 4mm expanders but I’d added some of Bait-Tech’s ‘The Juice’ to the water I used to pump them. The all in was shouted and I cupped in half a pot of expanders at ten metres and the same on the shorter line, I did also cup in a ball of groundbait at ten metres angled to my right but despite trying it and topping it up several times during the day I never had a bite over it. I started over the micros at ten metres and it took a while to get my first bite and the resulting strike saw a good skimmer leap out of the water, thankfully it stayed on and at around 1.5lb, I was off to a ‘flying’ (pun intended) start. A small skimmer and a roach followed and I was thinking I might be in for a good day when the bites just stopped. Jess and Rob were struggling although I’d seen Tom Mangnall on peg 30 catch a couple of small carp and Alex Murray over on 17 looked to be catching quite well. Apart from a couple of missed bites and some tiny roach, that was it for me in the first hour. Jess had a nice skimmer and then just as the second hour started I hooked a lively fish which didn’t feel like a carp and turned out to be a nice little tench of 10oz or so but it just wasn’t happening and I only added one half decent skimmer and a few blades during the remainder of hour two. It wasn’t just me though and nobody around me was catching silvers apart from Bruce Hunt on peg 19 who had resorted to catching some small roach. We had a few rain showers and along with the wind, I was starting to feel quite cold and not getting bites wasn’t helping much either! Over the next couple of hours it was really tough going and the only action I had came from two carp, Bruce landed a big perch that looked to be 2lb plus and was doing well and Rob reported that he’d seen Andy Hembrow over on peg 11 catch some nice skimmers. With two hours left and only around 3lb of silvers in the net, I came in on the five metre line for the first time. I’d been dripping a few micros in every time I shipped out but I wasn’t confident as this line hadn’t produced for me in the previous two matches. After a few minutes, I had a good bite which I missed and all of a sudden I was interested again. I hit the next bite and a decent amount of blue hydro exited the pole tip, I carefully shipped back before netting a decent skimmer. A few minutes later I had another and all of a sudden I was up to 5lb of silvers and there was still an hour and a half left. My next fish was a small roach so I went back on the longer line for a bit but only had another little blade. I’d just gone back on the short line when Scotty Russell turned up to see what was happening, the last time he brought me luck and I caught two skimmers while he was with me so I was hoping for a repeat performance today. With an hour to go, Jess and Rob decided they’d had enough and they weren’t the only ones to head off for an early bath, on the early pegs on the far side, Martin Addicott was the last man standing (well sitting actually but you know what I mean!). 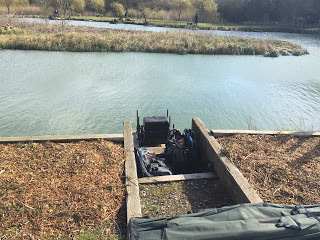 As I was chatting to Scotty, my float disappeared and I bloody missed it, there were some blows coming up over the feed and a few minutes later the float went again but this time I connected with it and another good skimmer was added to the keepnet. The next bite resulted in another tench, a lovely golden one of 12oz or so and there was still the best part of half an hour to go. He left me to it and went to see how Alex was doing and just after he left I had another decent skimbob followed by one of 4oz with just a few minutes left on the clock and I still had time to miss another bite. I only had 12 skimmers, two tench and a few tiny roach plus the two carp and I thought I might have between 6-7lb of silvers. I packed up and as I was loading the car, the Tart wandered down and was admitting to 30lb plus of carp, thankfully I couldn’t hear his coughing over the wind today! Pete started the weigh in over on the early pegs and it didn’t take long as the only anglers to weigh in were Martin Addicott with 23lb 9oz on peg 5 and Adie Richards had 4lb 6oz of silvers from peg 9. Then we got to Andy Hembrow who had a nice bag of skimmers and tench weighing 15lb and then had 24lb of carp to go with them, Adie Bishop then pushed Andy into second place when he put 47lb 11oz on the scales from peg 12. Ray Wickham did well from peg 15 when he weighed 7lb 6oz of silvers and I thought I might be close between us. 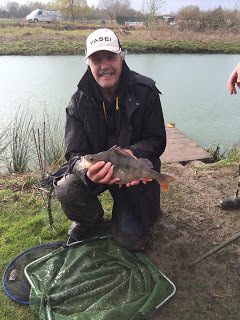 Alex Murray had 34lb 7oz from peg 17 and then Bruce went into second place in the silvers with 10lb 15oz which included that cracking perch which we weighed at 2lb 7oz. I knew I didn’t have double figures so I needed to either beat Ray or Andy needed to frame if I was going to sneak an envelope today. Mike West pushed Alex down a place when he weighed 35lb 13oz of mainly carp from peg 21 before it was my turn, my two accidental carp weighed 7lb 8oz before I pulled my silvers net out and it felt a bit more than I thought, Adie called 9lb 3oz so I was in third place in the silvers. Tom Mangnall had 23lb 1oz, Roy Hughes had 15lb 7oz and that just left the Tart and as long as he didn’t beat Andy’s weight I’d get second in silvers by default, of course he was miles out with his estimate and weighed 43lb 14oz to take second place and seemed more concerned about making sure he’d cost me money than the fact he’d framed, strange boy! 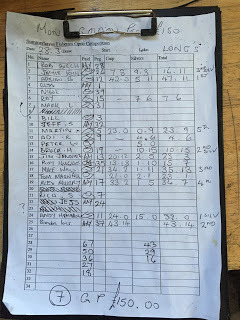 Back at the results, we all had a very welcome hot drink and Pete called out Adie Bishop as the winner with Brendon second, Mike West third, Alex fourth and Martin Addicott was last in the frame. Andy took the silvers as it was worth more with Bruce second and I was third and picked up £16 to keep my good little run going.